Whether you're one of those people who stash your receipts in a shoebox and wait until April 14 to sort out your taxes, or you simply get inundated with business cards when you go to a tradeshow, Shoeboxed can help organize receipts and convert the paper in your life into searchable online data. I wrote about a similar company called Pixily back in November, but Shoeboxed has much better pricing for a very similar collection of organized receipts. Shoeboxed is like having your own personal assistant for as little as $10/month. They won't get you coffee and answer your phone, but Shoeboxed also won't be surfing YouTube on your dime either. You mail them your receipts and business cards, they do all the tedious work of scanning papers in and making them useful. Business card scanning with conversion into files you can add to your Outlook contacts, Gmail contacts or other PIM software. If you're like me and acquire a bunch of business cards but then never follow-up because tracking them down is a hassle, Shoeboxed will start making you more productive instantly. And filing your paperwork will leave you more time to manage your life and your business. 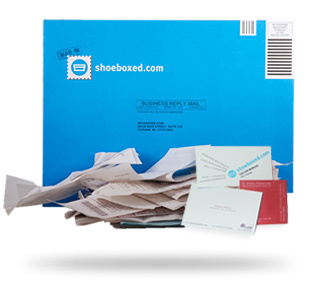 If you sign up for an Shoeboxed annual account, you can get 2 months for free.